Product #20680 | SKU 027600-0100-230 | 0.0 (no ratings yet) Thanks for your rating! 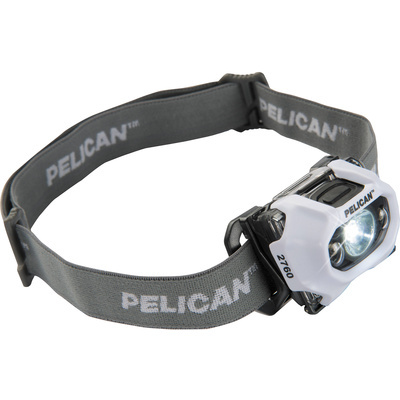 The white 2760 Dual-Spectrum LED Headlight from Pelican features a 133-lumen maximum output main white LED, two downcast LEDs that output 40 lumens and a low-power red LED to preserve night-adjusted vision. In addition to the 133-lumen high output from the main LED, there is a dimmer 90-lumen low mode and 93-lumen flashing signal mode. The downcast lights illuminate the area directly in front of you for walking in the dark or performing tasks. Its red LED also has a flashing mode that lets you signal your hunting partner, without spooking game. A ratcheting mechanism enables the head to pivot up to 45° for precise beam placement. The white polycarbonate housing is temperature, corrosion, and impact resistant, and it is IPX4 rated for water resistance. Its elasticized headband is adjustable to fit most heads.